I have been making decorative cakes for friends and family members for a few years now and wedding cakes are definitely a favourite of mine. After making several wedding cakes for other people I couldn’t resist the chance to make my very own in December 2014. My mum helped bake the cakes and I designed and decorated it, all 8 tiers!! 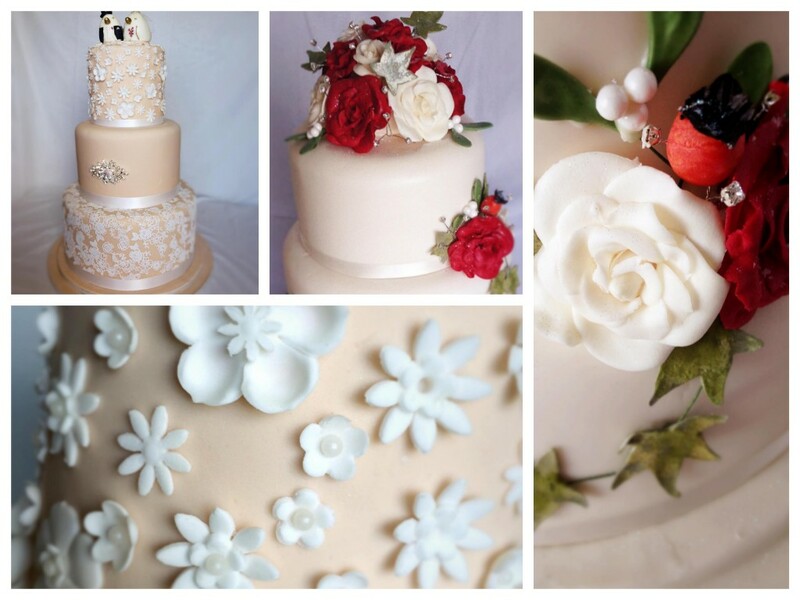 I like to design every wedding cake individually to each bride and groom, after all, it is one of the most special days in your life, and every detail should be tailored to your preference. Wedding cakes are a great way to display a couple’s personality and no longer have to be restricted by tradition or plain colours, in fact novelty cakes are on the rise! There are endless possibilities for cake design, but whichever you choose, it is essential that the cake reflects your theme or chosen colours. A wedding cake is an important element of your day; it is a main focal point during the reception and family members usually flock in their masses to photograph the bride and groom cutting the cake! The cake design you choose really depends on the theme and style of your wedding, but I am going to show you a sample of some of my previous wedding cakes and explain a few of the options. Just because a bride and groom have requested an all white or all ivory wedding cake, doesn’t mean that the cake has to be boring. By incorporating different textures you can create a cake with real presence. Textured rolling pins and embossing sheets are an easy way of creating clean and definite patterns, and cutters are great for making flawless shapes. Delicate petals can be made by thinly rolling out small circles of icing and working the edges with a balling tool until they become frilled. A brooch can add impact and should mirror the metal colour and stone/jewel colours used in the bridal accessories. A light dusting of mother of pearl petal dust will attract the light. Flowers, such as these ones, are created with sugar paste icing which can be rolled into a super thin sheet and will become hard when dried. They do require practice but handmade edible flowers are a beautiful and elegant touch. To make flowers such as roses look more realistic, they should not be one solid colour but should be deeper in the centre and become paler towards the outer petals. Floral cakes are not just for Spring or Summer weddings, I made a Christmas wedding cake with handmade roses and I added handmade mistletoe and ivy foliage for seasonal charm.for seasonal charm. Tiny flowers can be used in a modern pattern over a cake tier. By building layers of different flowers and adding some accent silver dragees, you can create a beautiful pattern. 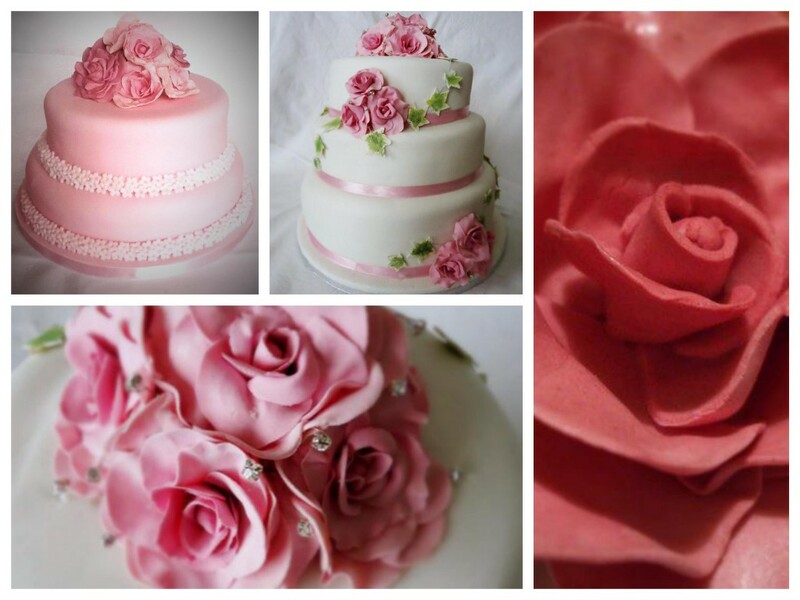 Using a contrasting base colour of icing to your floral accents adds another dimension. If you are not planning on having a traditional wedding, why not continue that theme into the cake and opt for a novelty wedding cake. 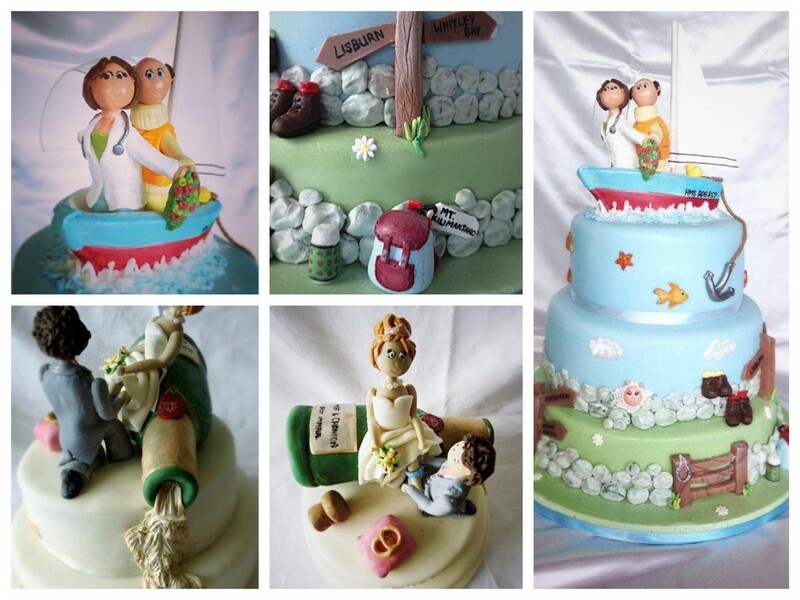 A novelty wedding cake does not need to be gimmicky, it can be very personal and quite romantic. In one of the examples shown here, I recreated the moment the groom puts the garter on the bride, and I added an overflowing champagne bottle to add interest to the side of the cake. I like to do a little homework before the wedding so that the bride and groom figures resemble the actual bride and groom and that the dress and suit are similar styles. The other novelty cake shown here was actually designed by my cousin’s wife for her sister’s wedding. The bride was a doctor and the groom worked on oil rigs; hence their outfits! They enjoy hiking and sailing so we added little motifs on the cake to represent this. I recreated a little ‘Jack and Rose’ Titanic pose too for a bit of romance! 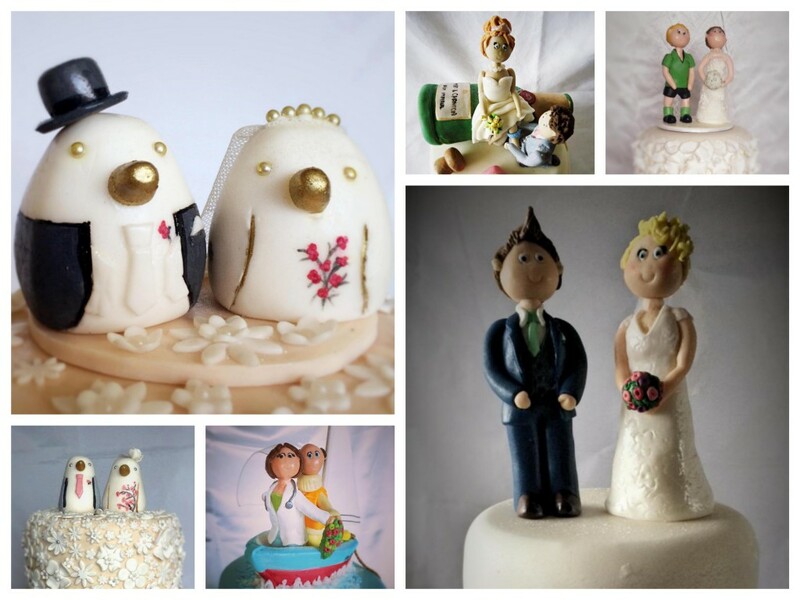 It’s always lovely to make an effort to create bride and groom figures that actually resemble the bride and groom. I always ask for details such as hair style and colour, eye colour, dress shape and colour, suit style and colour, and flower colour. Sometimes a couple will ask for the bride or groom figures to be wearing something personal to them like sports gear or a uniform. Or sometimes they ask for the bride and groom toppers to be symbolic, like these pretty little love birds!! 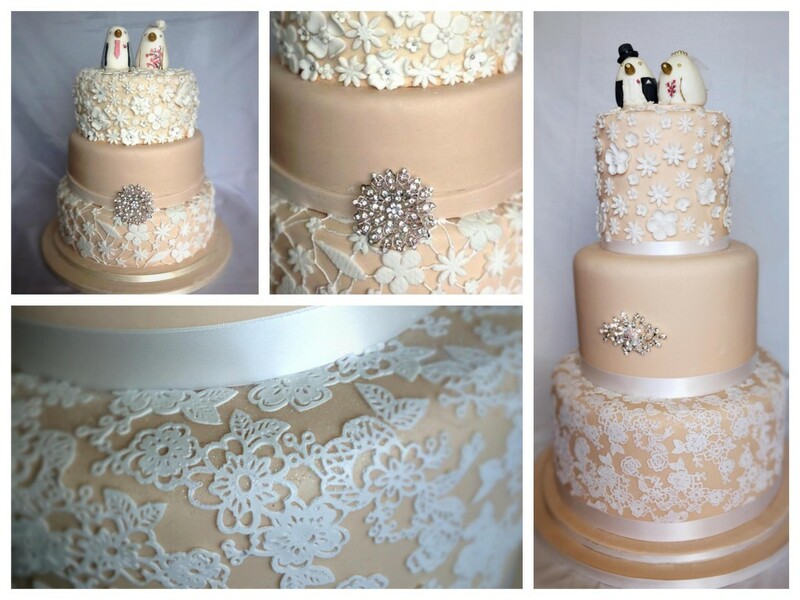 Lace has become very on trend in fashion, bridal wear and home wares, so why not add lace to your cake? There are different techniques for making lace; the most fundamental being cutting shapes from textured icing and joining them with fine piping work. More intricate cake lace can be made using embossed silicon mats and special icing which dries to a rubber like substance. 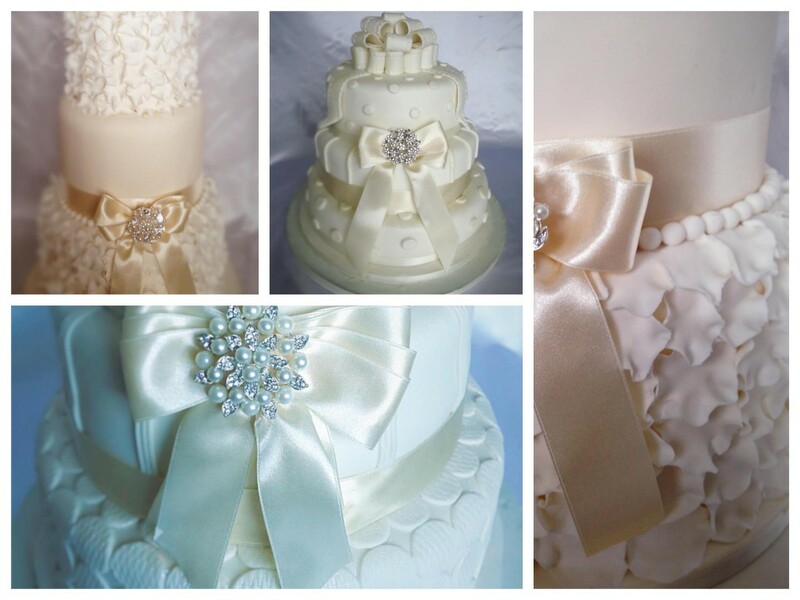 I have used cake lace on several cakes including my own wedding cake! It can be very delicate to work with but it is exceptionally beautiful. It is perfect for a vintage themed wedding and even more so if the bride’s dress has lace. I usually use lace on either 1 or 2 or the tiers, with a varied layer in between. 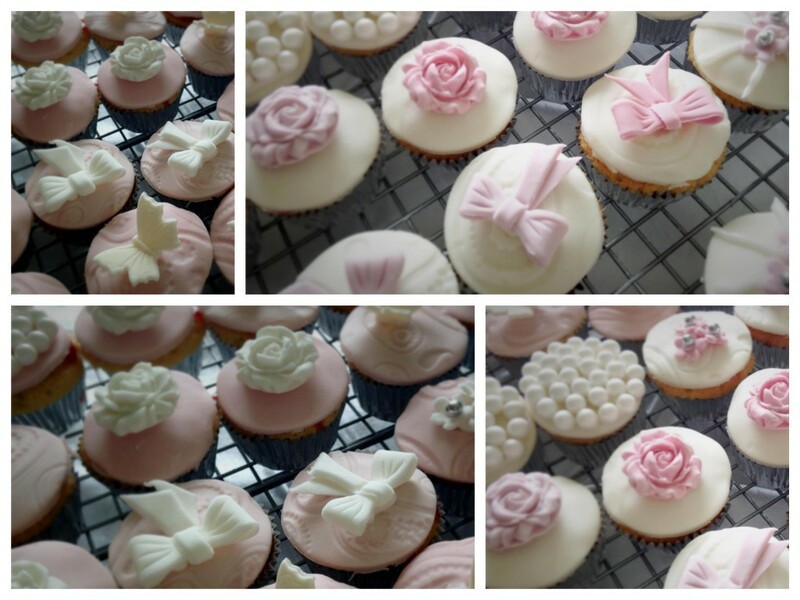 If a tiered cake isn’t for you, then cupcakes can make a beautiful, trendy alternative. The design options again are endless, but should reflect your theme or colours. I made these mini bite-size cupcakes for a wedding and are in a delicate colour scheme. 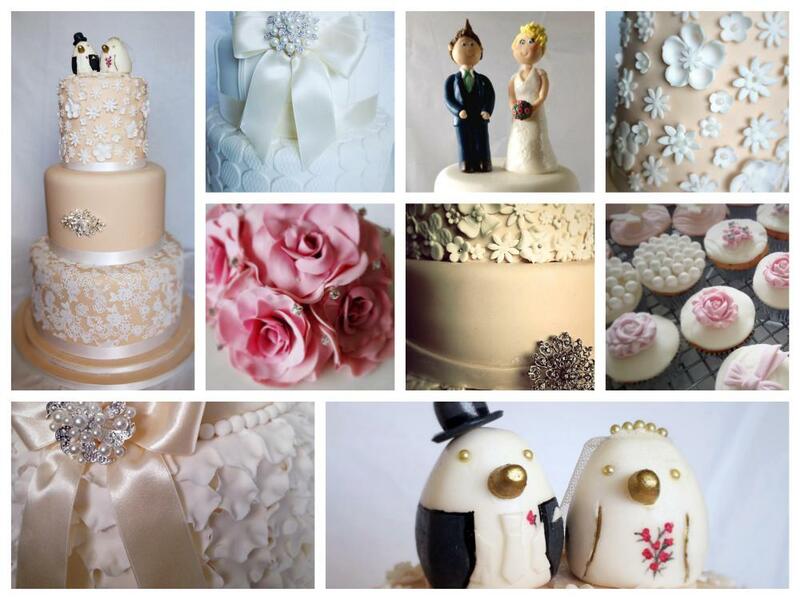 As you can see, there are lots of options when it comes to deciding on your wedding cake. The time of year and theme of your wedding will likely play a part in your final style of cake but don’t be afraid to inject some of your own personality into your cake. The wedding cake plays a big role in your wedding day as it is a focal point at the dinner. Use some of the examples above to inspire you when making the choice. For more help in deciding what’s right for your big day, simply drop me an email, comment below with your question or connect with us on Facebook and Twitter.